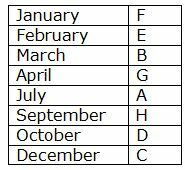 Eight persons A, B, C, D, E, F, G, H was born in different months January, February, March, April, July, September, October and December but not necessarily in the same order. H was born in a month which has less than 31 days. Three persons were born between G and C. As many persons were born before C was born after F. Two persons were born between E and A. As many persons were born before E was born after D. E was born before D. A was not born in first month. E was not born in March. H was born after B. H was not born in April. 1. Which of the following person was born in September? Three persons were born between G and C. As many persons were born before C was born after F.
Case 1 will be dropped because H was born in a month which has less than 31 days. Case 3 will be dropped because two persons were born between E and A. As many persons were born before E was born after D. E was born before D.
2. How many persons were born between G and B? 3. If F is related to B, A is related to D, in the same way which of the following is related to C? 4. Four of the following five are alike in a certain way based on the above arrangement. Find which one does not belongs to that group? 5. Which of the following person was born immediately after D? Eight persons L, M, N, O, P, Q, R and S lives in eight different floors. Lowermost floor is numbered as 1, above floor is numbered as 2, and so on. Top most floor is numbered as 8. Person name starts with consecutive alphabet does not live in consecutive floors. L lives either on third or fifth floor. Two persons live between L and N. Q lives immediately below N. Only one person lives between M and S. O lives immediately above S. R lives below P.
6. Four of the following five are like in a certain way based on the above arrangement. Find which one does not belongs to the group? L lives either on third or fifth floor. 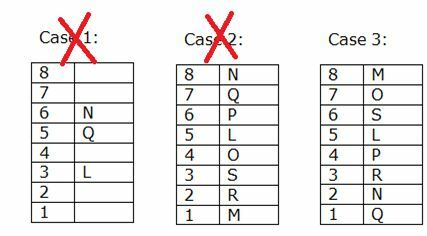 Two persons live between L and N. Q lives immediately below N.
Only one person lives between M and S. O lives immediately above S. R lives below P.
Case 1 will be dropped because only one person lives between M and S. O lives immediately above S.
Case 2 will be dropped because P and Q do not live in consecutive floor. 8. Four of the following five are like in a certain way based on the above arrangement. Find which one does not belongs to the group? 9. How many persons live between S and P? 10. Which of the following person lives immediately below R? H was born in a month which has less than 31 days. Three persons were born between G and C. As many persons were born before C was born after F. Two persons were born between E and A. As many persons were born before E was born after D. E was born before D. A was not born in first month. E was not born in March. H was born after B but not immediately. H was not born in April. 1) Which of the following person was born in September? 2) How many persons were born between G and B? 3) If F is related to B, A is related to D, in the same way which of the following is related to C? 4) Four of the following five are alike in a certain way based on the above arrangement. Find which one does not belongs to that group? 5) Which of the following person was born immediately after D? 6) Four of the following five are like in a certain way based on the above arrangement. Find which one does not belongs to the group? 7) Which of the following is true? 8) Four of the following five are like in a certain way based on the above arrangement. Find which one does not belongs to the group? 9) How many persons live between S and P? 10) Which of the following person lives immediately below R?